In recent days, it was announced via media that Parliament will be voting on the possible release of Julian Assange. I feel this would be a great relief to your government financially as well as gaining respect from your constituents. It has been over 7 years since this started and it is time for this nonsense to come to an end. Looking at the case as it stands, detaining him further makes a mockery of your honorable government and places you in a corner. Continuing to guard the Ecuadorian Embassy with police officers who are funded by the government is simply a bad decision and a waste of tax money. The citizens of the UK deserve that money to be towards their safety and Julian Assange simply is no threat whatsoever to anyone. Besides, the UN has ruled his detainment to be inhumane as he receives no sunlight, fresh air or proper exercise. This simply should be viewed as an embarrassment. It would certainly be in the best interest of the government and the people to allow him safe passage to his place of political asylum. Simply put, the constant surveillance is an eyesore and a thorn in your side. It would be a terrible travesty if, for any reason, Julian Assange should fall ill in the Embassy and would tarnish the UK’s reputation. Please take these things into consideration and release this refugee. My fiance and I knew that the coral known as zoanthid or more commonly known as Zoas, are poisonous but we didn’t realize just how bad it could be. On Monday, January 22nd, 2018, we found out accidentally. It’s common for owners of saltwater tanks or ‘reefers” to boil live rock when it gets algae on it. Algae is bad for the tank and thus must be gotten rid of. My fiance removed a rock covered in hair algae and put it on the stove in a pot to boil off the unwanted substance. What he did not notice was the 4 small heads of zoanthids growing amongst the algae. 3 hours we were both in the ER wondering if we were going to die from inhaling palytoxins. Good grief, you are thinking. How could this happen? Case studies show this is a common occurrence as well as the accidental ingestion or injection of this poison. Luckily, we knew what had happened but there is no known antidote. The only thing the doctors can do is treat the symptoms and hope for the best. Symptoms of palytoxin poisoning include the following: palytoxin symptoms. My fiance was not exposed like I was as I was sitting on the other side of the sink in the living room and he went to the back bedroom to use his computer. We were lucky, many are not. The biggest question I want to raise in regards to this horrible accident is why doesn’t the federal government regulate the sale of this poison? Why are there no warnings when you purchase zoanthids? Anything else that is a known toxin must be marked with a warning before purchase. Because it is unusual for someone to expose themselves to palytoxin, there are few case studies as my doctor admitted. We went to Mayo Clinic which is one of the best hospitals in the world and you could still see the fear in the doctors’ eyes as they attempted to treat us. I have severe lung damage from exposure which should improve with time and am lucky to be alive today. My ICU doctor informed me that my lungs looked like I had been in a high impact car crash and told me over and over again that he thought the prognosis was good (all, while the doubt in his mind, showed on his face). After treatments of steroids, oxygen, diuretics, 4 breathing treatments a day, threats of a breathing tube, oxycodone, Tylenol, and Benadryl I was released after 5 days in the ICU. I am currently healing at home. Please, before you buy any type of coral or fish for your tank, educate yourself on what you are buying and how to handle it safely. Can you even trust the media today? This is a very good question. So much of what we see and hear is made up propaganda to pass on a bias opinion. Many times, an article comes out only to be retracted as false. So how can we tell the difference? I am going to share a process I use. However, it is not 100% full proof by far but I think helps. Has the story been repeated by several credible news sources? Has the story been retracted or proven false by another media outlet? Watch multiple media outlets. Don’t just watch a liberal channel or a Republican channel. Make time to watch both to see what each says about the headlines. Then make your own educated decision which is right. Wikileaks is a reliable source of information in that they have never had to retract a story in 11 years and have won all court cases accusing them of false information. They do not have all the answers to your questions but if they say something, believe it. Not all conspiracy theories are true as we all know. Look it up in a reliable search engine. Educate yourself so that you can’t be led astray by fake news. In recent days, the Freedom of Press Foundation dropped its support of Wikileaks and it’s founder Julian Assange’s legal fund citing ““FPF’s board unanimously found — upon review of the available evidence — that the financial blockade by the major payment processors is no longer in effect, and as such, we will soon cease processing donations on behalf of WikiLeaks readers, as stated by Trevor Timm.” (Washington Times article ) This being said, the truth is far from this statement as the U.S. DoJ continues to seek prosecution of Wikileaks staff and Assange as well as the government advocating the end of Wikileaks donations through the introduction of new bills like Section 623 of the Intel Act of 2018. In recent weeks, Freedom of the Press has chosen to end its five-year stint as a surrogate for Wikileaks donations. According to the Washington Times, (article seen here Washington Times articles ) FPF dropped them because ““FPF’s board unanimously found — upon review of the available evidence — that the financial blockade by the major payment processors is no longer in effect, and as such, we will soon cease processing donations on behalf of WikiLeaks readers,” Trevor Timm, the foundation’s director, wrote in a Dec. 9 email to WikiLeaks publisher Julian Assange. But is this the real reason for the sudden unanimous decision by the board to end support? Is it possible that the Freedom of Press Foundation dropped support for Wikileaks due to a strategy outlined in the “Wikileaks Threat” PDF? (Seen here Wikileaks Threat link ) Did an agency of the US use this strategy to turn the board of directors at FPF against it’s Founder? I have included a copy of part of the strategy used by First of America in 2010 and the following intel agencies ( Palantir Technology, HBGary & Berico Holdings) in hopes of destroying Wikileaks. As you know, this strategy didn’t work. Is it possible that the board voted unanimously because they were pushed and chose professional preservation over their own belief system? In February of 2017, Wikileaks and Julian Assange began running #Vault7 revealing CIA documents exposing 4th amendment violations of US citizens privacy. These documents also showed the incompetence of this agency and was an embarrassment to the organization. Was there response to use this strategy to destroy Wikileaks and put doubts in the minds of moderate supporters? Did the CIA fuel the fire by pushing the “Russia” narrative on to the left-leaning board members in order to further sabotage their relationship with Assange? Was this all a plan to plant hatred in the minds of both sides? After all, Julian Assange founded the Freedom of the Press Foundation when the bank blockade of Wikileaks took place. How better to bring down the morale of the staff and the editor himself than to pressure the foundation into dropping their support? Is the “Russian” witch hunt more than just a plan to impeach Trump but to also put an end to the existence of Wikileaks and its director Julian Assange? Many of the directors were unhappy with the results of the election and the media placing the blame on Wikileaks would further feed the fire. How better to slander the name of the editor and publisher of #Vault7 then to have his own colleagues defame his name on social media? The CIA would not hesitate to use such a strategy against what they think of as a foe, so why not? Media already has pushed a disinformation campaign against Wikileaks in the past and continues to spread false facts. It wouldn’t be hard to push this in the right direction and disenchant those who are on the left to turn on WL. It is already happening with the average liberal citizen so why not the FPF who are mostly Democrats? The CIA or other agencies could easily identify certain board members as potential turncoats, looking for behavior that would show doubt in Assange. Believing that Wikileaks would fold without the support of the Freedom of the Press Foundation, any smart intel organization would target such individuals with propaganda and pressure. Will we ever know if this is the case? Maybe not but then again, a lot of things come to light when we don’t expect them to. In recent days, since Christmas when Julian Assange deleted his Twitter account, there have been rumors flying that include his possible “safe passage” to the US and that he is free. However, they are just that, rumors. I will explain why and also show you the possible charges the Department of Justice in the United States is looking at charging Wikileaks and Assange with. First, let’s look at the current hearsay that Julian has received safe passage to the US via a Navy vessel to the United States and is currently in a “safe house” to testify. The United States DoJ and CIA are wanting to arrest Wikileaks staff and Julian with charges, including conspiracy, stealing of government property and/or violating the Espionage Act, because of the cables on war crimes in 2010. (See Washington Post article Justice Department Debate ). President Trump in April responded to the question whether or not the DoJ should pursue reopening the case with “Go ahead”.There was never an offer from Assange to trade information for a pardon on the table as many fake news sites reported. The United States government still wants to arrest Assange and put him behind bars for being a publisher. Therefore, the idea that he is in the United States under protective custody is not only false but a blatant lie. For whatever reason Assange deleted his Twitter account on Christmas Day, it has nothing to do with rumors that he is exchanging information with the United States. The United States continues to seek extradition of Wikileaks staff and Julian Assange.Also, people who are close to Julian would sound the alarm had Mr. Assange disappeared. First of all, his mother would contact every news source she could I am sure. He has close friends and staff members who contact him frequently and they would’ve been up in arms. So, let’s put this to rest now and sleep easy. 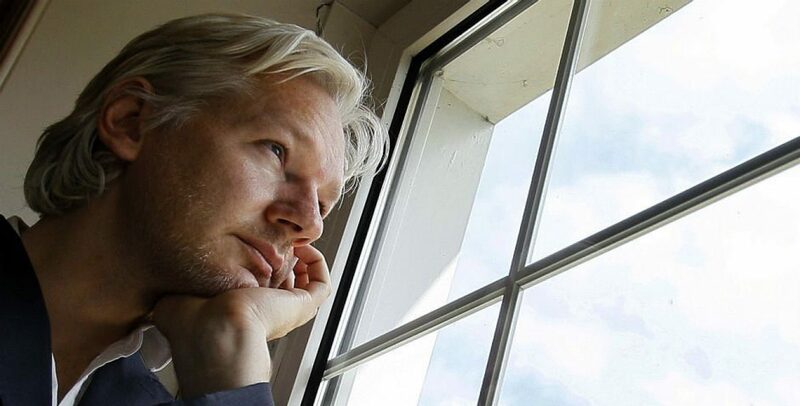 Julian is safe in the Embassy as he has been. No worries.